Most of us, if asked, probably have some sense of denominational affiliation, or at least partiality. Perhaps you grew up with close ties to a certain denomination. For some of you, maybe you've been able to work within that same denomination throughout your career. For others of us, our work experience is varied - based on jobs that become available, places we live, worship styles, family decisions, etc. I know, for me, my experience includes Episcopal and United Methodist (growing up) and United Methodist, Disciples of Christ, UCC, Presbyterian, and American Baptist/United Methodist throughout my career. How are Methodists different from Lutherans? What sets PCUSA churches apart from PCA? What does it mean to be congregational? Beginning during the 16th century Reformation, Anglicans embraced features of the new Protestantism while retaining certain characteristics from the Roman Catholic Church (source). For this reason, it was considered a “middle road” between the two branches of Christian faith. The Episcopal church (in the U.S.) is one of the most well-known denominations within this movement. Episcopalians and other Anglican churches around the world are known for their emphasis on the Eucharist (Holy Communion) in worship and their use of The Book of Common Prayer and other contemporary liturgies. Lutheranism (coined by Luther’s opponents) began as an evangelical (as it was known at the time) response to the Roman Catholic Church and its doctrine and theology. It emerged along with the Reformed tradition, though the two branches of early Protestantism had contradicting viewpoints. One key difference between Lutheran and Reformed churches was their beliefs about communion: Lutherans believe that the wine and the bread are Christ’s actual body and blood; Reformed churches believe that the wine and the bread are symbols of God’s grace and a way to unite with Christ through faith (source). The heart of Lutheran doctrine is the belief that "humans are saved from their sins by God's grace alone (Sola Gratia), through faith alone (Sola Fide), on the basis of Scripture alone (Sola Scriptura)” (source). The spread of Lutheranism throughout the 16th century carried with it a notable contribution to Protestant hymnody, including numerous chorales composed by Martin Luther himself. Today, there are two primary branches of the Lutheran church in the U.S.: the Evangelical Lutheran Church of America (ELCA) and the Lutheran Church - Missouri Synod (LCMS). ELCA churches are more progressive - with women clergy, an open communion table, and acceptance of LGBTQ individuals - while LCMS churches are on the conservative side of those issues. Read more about what sets these denominations apart here. Lutheran churches may be independently governed (congregational polity) or use Presbyterial or Episcopal governance. The Reformed tradition (along with Lutheranism) grew out of the Protestant Reformation during the 16th century. Informed primarily by the ideas of French and Swiss theologians John Calvin and Huldrych Zwingli, it was often referred to as “Calvinist,” a term coined by Lutherans, though Calvin and Zwingli preferred the term “reformed." There are two primary branches of the Reformed church in the U.S. today: the Reformed Church in America (RCA) and the Christian Reformed Church (CRC). The RCA is the more progressive of the two, valuing unity and ecumenism and taking a more liberal stance on social issues. The CRC is more conservative in its beliefs and viewpoints and values doctrinal purity. 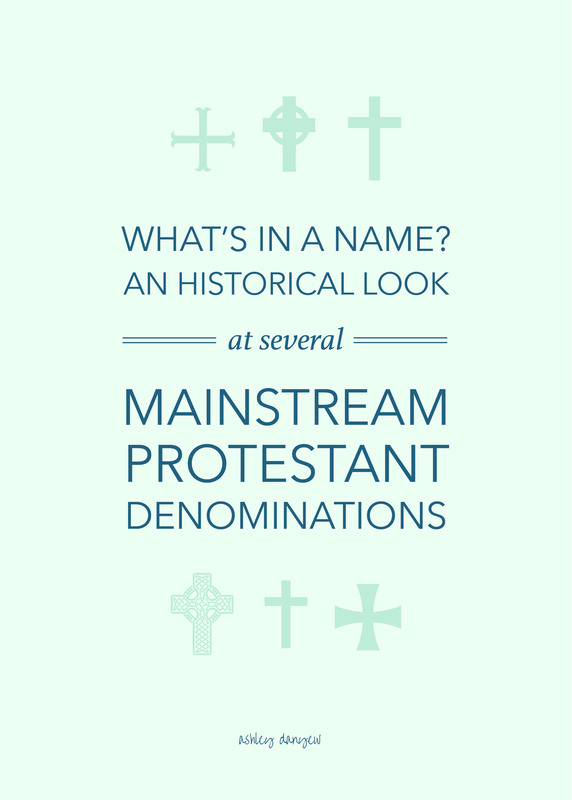 Here is a great article outlining some of the differences between these two denominations. Both denominations use the Presbyterial model of governance. Also like Presbyterians, they are confessional in nature, meaning they use a collection of historical creeds and doctrinal statements to corporately express their beliefs. Emerging as part of the Puritan Reformation in England during the 16th and 17th centuries, members of the early Congregationalist movement were called Separatists or Independents to distinguish them from Presbyterians and those who considered themselves part of the Reformed tradition. This was more a matter of governance than doctrine or beliefs: Congregational churches wanted to be independent and autonomously governed as compared to Presbyterians, governed by elders, and Reformed churches, which, at the time, used the Presbyterial or Episcopal form of governance. Their belief that an adult conversion experience was necessary before becoming a member of the church had an effect on the emerging Baptist movement. Today, Congregationalism has three primary branches: the United Church of Christ (UCC), a union of the Evangelical Reformed Church and the Congregational Christian Churches in 1957 (source); the National Association of Congregational Christian Churches; and the Conservative Congregational Christian Conference, the most conservative of the three (source). Strongly influenced by the work of John Calvin during the Reformation and guided by the work of his protégé John Knox, Presbyterians have strong Scottish and English ties (source). Presbyterian churches are confessional in nature, meaning they use corporate confessions of faith in their services to express their faith and outline a communal view of theology (source). There are two primary branches of the Presbyterian church in the U.S. today: Presbyterian Church (U.S.A.) (PC-USA) and Presbyterian Church in America (PCA). PC-USA churches are more progressive and liberal in their views while PCA churches are more conservative and tend to adhere to the traditional, reformed doctrine. Read more about the differences between these two types of churches in this helpful article. Presbyterian churches are governed by a group of elected elders (session), a local group of higher elders (presbytery), and a regional governing body (synod). The Methodist movement began in the 18th century as part of the revival within the Church of England and was based on the life and work of brothers John and Charles Wesley. It became a separate denomination after Wesley’s death. The denomination as a whole is known for its rich musical heritage, including many hymns by Charles Wesley. Methodists are evangelical in doctrine and believe in the Arminian concept of free will and salvation being available to all (source). A union of The Evangelical United Brethren Church and The Methodist Church, formed in 1968 (source). Organized in 1860, the term “free" was added because this new church (separate from the Methodist-Episcopal Church) "was to be an anti-slavery church . . . pews in the churches were to be free to all rather than sold or rented (as was common), and . . . the new church hoped for the freedom of the Holy Spirit in the services rather than a stifling formality.” (source). Free Methodists share many of the same doctrines and beliefs as United Methodists, though the former tend to be more literal when it comes to interpretation of scriptures and less ritualistic in their style of worship. Emerged around the turn of the 20th century as part of the Holiness movement. Doctrine and beliefs are very similar to that of United Methodists, based on Wesley’s teachings and Protestant Arminianism, though there are a few marked theological differences. Read more here. Methodist churches are presided over by bishops (Episcopal polity). The Baptist movement began during the Protestant Reformation and emerged from the English Separatists group. The name comes from the group’s beliefs about baptism: that it must be done by immersion and should be performed only for believing adults (not infants). There are dozens of different variants within the Baptist tradition, but for the sake of keeping things simple (and keeping this post reasonable in length! ), I’ll talk about two primary branches: American Baptist and Southern Baptist. Baptist churches, like congregationalists, are autonomous and self-governing in their organization. The Restoration Movement was part of the Great Awakening in early 19th-century America (source). A group of like-minded pioneers (Methodists, Baptists, and Presbyterians) came together, abandoning denominational labels and simply calling themselves "Christians." One denomination that stems from this movement is Disciples of Christ. As a whole, Disciples of Christ value unity and ecumenism. The denomination originated in the early 19th century when Thomas and Alexander Campbell in Pennsylvania and Barton Stone in Kentucky created movements to pull away from the Presbyterian church in favor of creating a communion table open to all (regardless of denominational affiliation) (source). Disciples of Christ churches are congregational in their governance. I realize this is a small sampling of denominations, in the scheme of things; for a comprehensive list and more historical details, see this article. I hope this is helpful to you as you navigate different denominations in your life and career and learn about what each one believes and values. Isn’t the history fascinating? It’s amazing to me how many common roots we share dating back to the 16th century. How many different denominations have you been a part of, in your life and work?